Anna Mae Jones Wagaman, 103, formerly of Lancaster, went home to be with her Lord on Monday, March 12, 2018 at Pleasant View Retirement Community, after a short illness. Anna was born in Lebanon County to William and Nora (Ulrich) Jones on April 5, 1914, the oldest of nine children. She worked at the silk mill in Annville, Consolidated Cigar in Lancaster, and in the cafeteria of Nathan Schaeffer Elementary School. Family was the most important thing in her life. She was pre-deceased by her husband, E. Linwood “Bud” Wagaman, in 1977. Their only child, Joyce Wagaman Fultz (Merrill), passed away in 2010. Anna is survived by a granddaughter, Linda Nauman (Steve), and a grandson, Thomas Fultz (Paula). 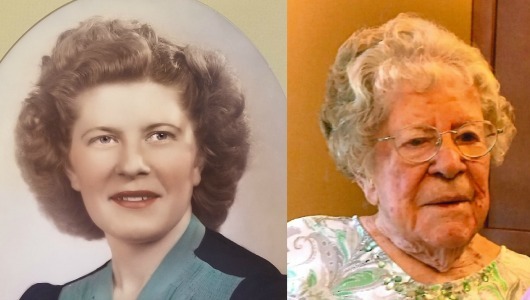 She is also survived by four great grandchildren – Jeffrey Nauman, Jennifer Lamoreaux (John), Nicole Nauman, and Amanda Budovec (Greg), as well as six great-great grandchildren – Anna Nauman, Claire Nauman, Payton Budovec, Kasey Budovec, Chase Budovec, and Kylie Budovec. She also leaves behind a sister, Judith Gibbons, and numerous nieces and nephews. Everybody who knew Anna was impacted by their time spent with her. Anna was an amazing cook! Her soups were the best around, along with her baked beans, pot pie, and candied sweet potatoes. Many people were fans of her coffee cake and strawberry pies. She was a big fan of the Phillies. People were always astounded by her amazing memory! Anna was a member of Zion Evangelical Lutheran Church in East Petersburg. The family wishes to thank the staff of Pleasant View, especially the rehab unit and 500, for the excellent care and love that they showed Anna for the last three years. So sorry to hear about Mamaw passing! Anna will be missed by many. Anna was a wonderful woman, I’m grateful to have had the pleasure of knowing. She has touched my life in so many ways. Whether it be by the long talks we had, the amazing stories she shared with me or the words of wisdom she always offered. She was one of a kind and I will miss her. She will always have a special place in my heart. Thoughts and prayers sent to you all, I hope you find comfort and healing in knowing how much she is loved and how great of a woman she was. Thoughts and prayers go out to your family at this difficult time. God bless. I am deeply sorry for your loss of Anna. May you find comfort in the many precious memories you shared together as well as God’s promise to restore our dear loved ones to perfect life on a paradise earth. As you contemplate that promise, draw close to God in prayer and he will provide the needed strength to carry you through the difficult days ahead. All the best wishes for your family at this time, take care of each other. I loved my times with anna and she will on in my heart forever. She always asked about my husband and my dogs. Anna knew I have such a love for the animals and would hope she would understand that I cannot make her service. I am helping an owner try to recover his dog who has been missing for 3 weeks. I know I will be doing this rescue in annas honor. To the family-you were her rock as she was yours and she beemed every time she could report a new baby!!! So sorry about your grandmother’s passing. May God give you His peace!